Rocketry is about more than space launchers or missiles - there's also an important branch that has played an important, though mostly unsung role - sounding rockets. Named because they ‘sound out’ what’s going on ‘up there’, sounding rockets have launched small payloads to the edge of space, carried instruments to great heights, and been important in rocket motor development. The two most important such rockets have been the British Skylark series (last flight 2005) and the American Aerobee. From first flights way back in 1947, the Aerobee was developed into the Aerobee-Hi (first flight 1955), the X-8 ‘X-Plane’, and the 150, 170, 300 and 350 series. They varied in performance, including altitude, from 130-450 km (81-280 miles) but all were suborbital. 1037 Aerobees flew in total, the final one being a 150-series launched by NASA on January 17, 1985, making today the 25th anniversary of that last flight. Scale models of sounding rockets have been few and far between, though rocketeer hobbyists do fly replica Aerobees. Some of these carry instruments and are so large that they are actually classed as small sounding rockets. Plastic kits are even fewer, but Revell did make a kit of the Aerobee-Hi, the type that would have been launched from White Sands and Wallops Island in the late 1950s and early 1960s. 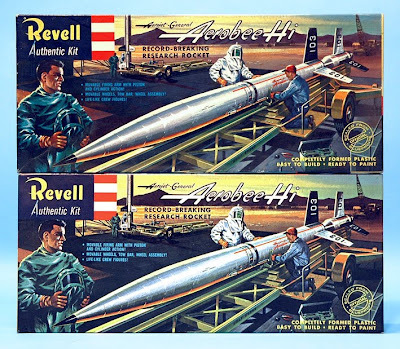 It was in the same Revell S-Series range that featured various rockets and missiles, though the Aerobee-Hi and X-17 were the only ones that were first and foremost ‘experimental' rockets. The kit is typical of Revell from that period - as well as the rocket, the box also contained a transporter-launcher and three crew, one of whom was sculpted wearing a fireproof suit. The kit looks good, with fair attention to detail, and the erectable transporter-launcher really adds to the appeal. A pity though, that Revell never included a pickup truck (a Ford F-series would have fitted the bill) to finish things off. The Aerobee-Hi was not reissued until the start of Revell's Selected Subjects Program (SSP), so was on the ‘wanted’ list of many modellers for a long time. But in Summer 1996, the SSP Phase 15 included the Aerobee-Hi, allowing many modellers to actually build the kit, not just stare at the bits in a box. Will it be reissued again? Here’s hoping! 1 Compare the boxes. Some SSPs have been in differently-sized boxes to the original, but the Aerobee-Hi matched exactly, so much so that at first glance it’s difficult to tell them apart. Here the original is on top, the SSP box looking slightly ‘electronic’ and ‘bright’, as it was scanned from an original, but is still pretty good. 2 The side panel gives a few things away. The SSP issue does not mention Revell’s Type “S” Cement’ (it hadn’t been made for years) and you can just make out newer copyright details and address. 3, 4 Two views of the assembled kit, in transport position and raised for launch. 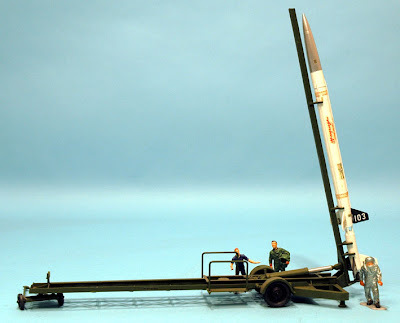 The Aerobee-Hi is not presently available from new, but you can see another Revell reissue, the 1:40 scale Nike-Hercules missile here.